The Vivitek D511 is the first data projector we've seen from the Taiwanese company and on first impressions it's a great example of what an entry-level projector should be. The compact body of the projector weighs in at a portable 1.9kg and while it's not the toughest construction around, it offers good value for money. The manual focus ring protrudes from the front of the casing, while the zoom is fitted behind it and hidden away inside the body of the casing. Buttons on the top of the unit offer the standard array of controls, with a large Power button and a ring below this with Menu, Source, Auto and keystone correction controls. The Vivitek D511 ships with a mini remote control that mirrors the controls on the top of the unit. The menu controls are easy to get to grips with, but you will find that some of the controls are hidden away, such as the Eco-mode. You'll find a full array of ports on the back consisting of the standard D-sub, s-video and component ports, and an HDMI port for connecting to a digital source. With full support for 720p output, the D511 has a native resolution of 1024 x 768 pixels, but will upscale to 1600 x 1200 pixels with ease. 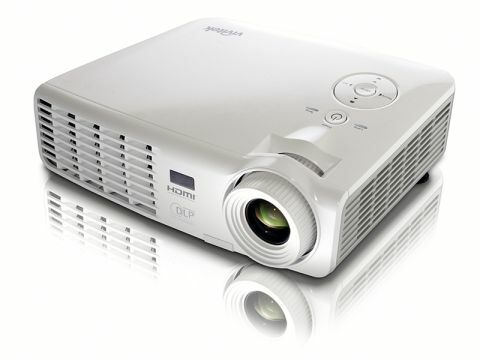 This projector is also 3D ready and so is capable of making the most of the big changes in presentation technology. When it came to image quality, we found the D511 had quite a short throw range, so it isn't ideal for larger meeting rooms. In the home or small office, however, images look crisp and sharp. Dropping the projector down into Eco-mode marks a noticeable drop in the noise generated by the fan, while it still manages to maintain a respectable brightness level. The Vivitek D511 offers a fair degree of future-proofing for such an affordable data projector. Sure, it lacks the build quality of some other machines, but it still represents great value for money.